East Peoria, Ill. - The Metamora Redbirds (16-5) (6-3) played the East Peoria Raiders (2-20) (0-9) on Saturday night in East Peoria. We could just leave it at that, or we could tell you the bizarre situation that happened prior to the game. In the preliminary sophomore game, the teams had broken their final huddle and were getting ready to go to center court for the opening tip. In fact, East Peoria was already lined up in position and ready to go. Hold up. There's a leak in the roof. Yes, what the area had received recently in terms of snow had become too much for East Peoria's skylights, and mist was coming through and onto the floor. The sophomore game was moved into an auxiliary gym on campus, while EPCHS maintenance staff went to work on the skylights. 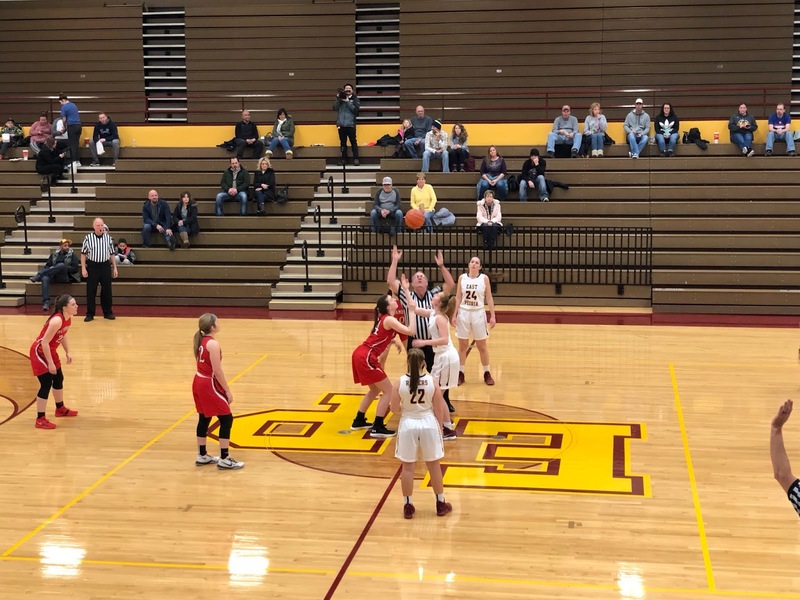 The situation was that if the main gym issue couldn't be fixed in time for the varsity game, Metamora and East Peoria would have to give it a third try to play. Yours truly was in the main gym while this was all going down. They brought in a gentleman on a lift to go up to the skylights from the inside. He patched the skylights that were leaky with what appeared to be cut up garbage bags and duct tape. Hey, whatever works, right? The varsity game would go on as scheduled. It got off to a rough start for the Redbirds, but only a start. A pair of turnovers and a back-and-forth, almost rugby-style scrum were some low points early on. There may not even be an argument that there were next to no negative moments the rest of the game. After that was all said and done, the scoring came in a flurry. Katie Lalumandier, a freshman nonetheless, had a quality quarter, scoring five of her eight points. Alivia West, Kaylee Hieronymus, and Alana Terry combined for 14 of Metamora's 21 points in the quarter. The Redbirds took a 21-8 lead after the opening eight minutes, marking the first 20+ point quarter since December 21st against Morris (29). Momentum continued into the second quarter when the threes started falling, and who hit them may not be a surprise. Anne Peters and Reagan Begole made a trey each. What has become a theme for the Redbirds is balanced scoring. That stood true in all four quarters on Saturday. In the second, six different players scored and seven had scored by halftime, the most since the aforementioned Morris game. By half's end, the Redbirds' scoring went down, but so did the Raiders', allowing Metamora to take a sizeable 38-14 lead into the halftime locker room. 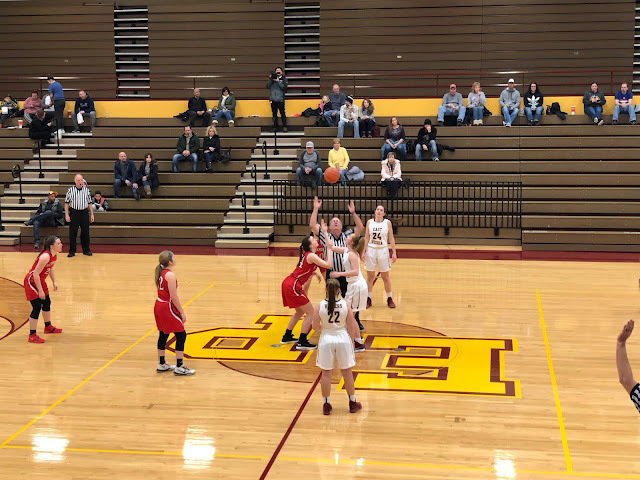 Neither team was on a good track in terms of scoring, but in overall play, the Redbirds stayed the course, utilizing their quickness and specifically their press to limit the East Peoria offense as much as they could. The third quarter saw another decrease in scoring on both sides, but neither by much at all. Alivia West solidified a quality game by scoring six in the quarter to finish with a game-high 12 points. Metamora hit their third three of the game when Lexi McClure got one to go for her fifth points of the game. Sarah LaHood and Inell Davis Watson were the only scorers for the Raiders. It was going to be running clock, a new rule in the IHSA this year. If a team is up by 30, at and only as early as the start of the fourth quarter, the clock runs. So, Saturday, that happened. Despite the clock doing its thing, the Redbirds still managed to put 16 points up on the board for the quarter. Once again, six players scored, and only one had made more than one shot, that being freshman Elena Redgate. Hannah Tellor, Lalumandier, Makenna Youngquist, and Terry had made the other shots. The game went to the Redbirds by plenty. 49 to be exact. The Redbirds would walk away with their 16th win of the season, winning over the Raiders by a score of 69-20. Anne Peters (10 pts) and Kaylee Hieronymus (10) joined Alivia West as the double figure scorers for the game. The win makes Metamora the winning-est team at (16-5) since going (19-12) back in 2009-2010, when the team won a regional championship and lost in the sectional championship. Next week is a big week for the Redbirds, hosting Dunlap on Tuesday and traveling to #3 Morton on Saturday.